I never considered myself a big zucchini fan until this summer. Farmer’s market zucchini is what really sold me; before then, I could take it or leave it. I was used to buying small, shriveled up zucchini from the grocery store, so when I tried freshly picked zucchini it was a game changer. My favourite way to prepare it is to sauté green and yellow zucchini with patty pan squash in a bit of olive oil, Herbamare, and pepper. It’s so simple and incredibly tasty. This morning I took advantage of our holiday Monday and made zucchini muffins for breakfast. 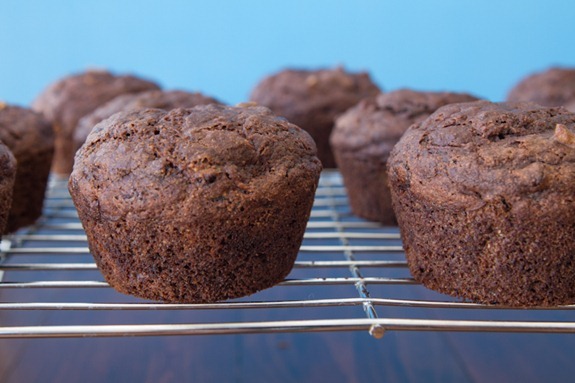 I’ve had great luck in the past with oil-free zucchini bread and I hoped these muffins would follow suit. They are fairly low in sugar, completely oil-free, and have a nice dose of crunchy walnuts for healthy omega-3 fatty acids. These aren’t your typical heavy and dense muffins; they are light as a feather and almost cupcake-like in texture. I enjoy them with a pat of soy-free Earth Balance to add a bit of moisture and buttery flavour. From start to finish, they were ready in 30 minutes flat. Not too shabby! Lightly sweet, whole wheat, and oil-free, these muffins make a special breakfast or take along snack. I love them with a pat of soy-free Earth balance to add a bit of moisture. Whole Wheat Pastry Flour works well in this recipe to create light muffins that are still 100% whole grain. You can also use all-purpose flour if that’s all you have on hand. I don’t recommend subbing the pastry flour for regular whole wheat flour as the muffins will likely turn out too dry and dense. Adapted from: Oil-Free Zucchini Bread. 6. 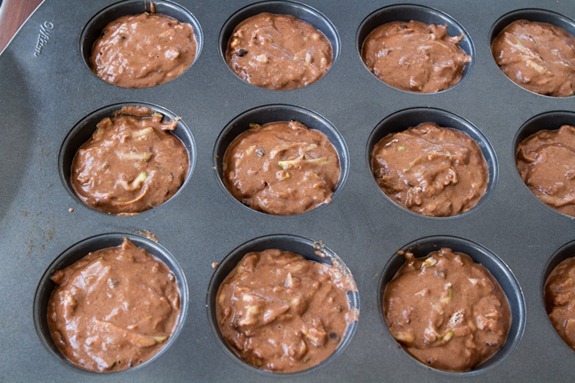 Spoon batter into prepared muffin tin filling each tin 3/4 of the way full. Bake for about 15-17 minutes at 350F, or until muffins slowly spring back when touched. A toothpick should come out mostly clean. Cool in tin for 5 minutes. With a knife, loosen around the muffin edge and transfer to a cooling rack until completely cool. Have a great Civic Day to those of you celebrating the long weekend! I’m off to enjoy the last couple hours of the afternoon by the water. Why does three days of weekend always seem to fly by just as fast? Oh wow, I’ve been looking for a good breakfast muffin and this looks like it’ll do the trick just fine! YUM! Do you know how many calories this has? Hey Ash, I’m sorry I don’t have the nutrition info. Zucchini has been particularly good this season. I’ve been eating it raw dipped in nut butter, or making zucchini bread protein shakes a lot. Love the looks of these muffins! One question – that’s a ton of baking powder. Do you think it would work with a little less, or would it be too dense? Hey Laura, you could probably get away with 2 tsp but I wouldnt use any less. Hi Dee, The recipe in my cookbook reflects an updated version of these muffins. It underwent further testing which is why the ingredients differ slightly from the original. I would recommend using the book version (and I may consider updating this one here, too!) Happy baking! Oh, WOW! You totally had me at “oil-free” !! Yum….and I just so happen to have some zucchini on hand! These sound perfect! Those sound awesome. I just might have to make those tonight if I don’t have to work. 30 minutes? Too awesome! These look SO delicious Ange! I love zucchini now and am probably known at the grocery store amongst the workers as “that girl that hoards all of the zucchini”. (LOL, well actually, zucchini AND carrots…. and watermelon.) Whole wheat pastry flour is what I use in pretty much all of my baked goods. You’re right.. regular whole wheat is dense… I’ve had rock muffins many times! Enjoy the rest of the holiday! These looked so good I had to make them right away. Except I didn’t have any zucchinis but I did have some bananas that were over ripe so I substituted them. Just reduced the sugar a bit and they are super yummy too! You are fast!! Glad you enjoyed them and good to know they work with banana. How many banana did you use? Hi Angela! Do you suppose I could sub in soy milk and carob powder? I can’t have chocolate these days. I loved your blog before nursing my second gave me dietary restrictions, now it’s an invaluable resource. Hey Julia, For sure you can swap the almond milk for soy milk. As for the carob – it has quite a unique flavour, but if you like the taste, I can’t see why it wouldn’t work. Maybe try using a bit less and adding it to taste? Yes for sure, you can omit the nuts, it just won’t have a crunch to it. Wow, these look amazing! I love it when there is chocolate involved and it is so healthy, will have to make these on the weekend if I can wait that long. If you figure out what happens to that extra day of weekend, be sure to let me know! Jeez. It’s nuts! 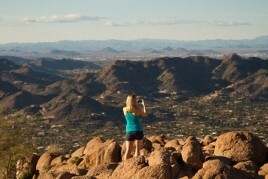 Although, now that I’m working 100% on the blog and my nutrition practice, I seem to be losing track of time and days. Everything just kind of meshes together. I am very jealous of your long weekend, you are so productive on a day off! Do you think you could bake this is a traditional loaf form? Either way they look great! I would suggest checking out the zucchini loaf that I linked to. That one is great! I love zucchini muffins! I usually enjoy them with walnuts, carrots, cinnamon, and raisins, but these look fantastic! I’ll definitely have to try them. Wow–those look awesome! And with zucchinis around everywhere right now, it’s the perfect time to try out the recipe. :) I will also look at the loaf recipe! They look amazing! Yumm… do you think subbing white whole wheat flour would work? Those look delicious! I’ve always wondered what the point of whole wheat pastry flour was – thanks for clearing that up! Zucchini notoriously take over everyone’s garden this time of year – luckily it’s perfect for throwing in just about anything and everything! 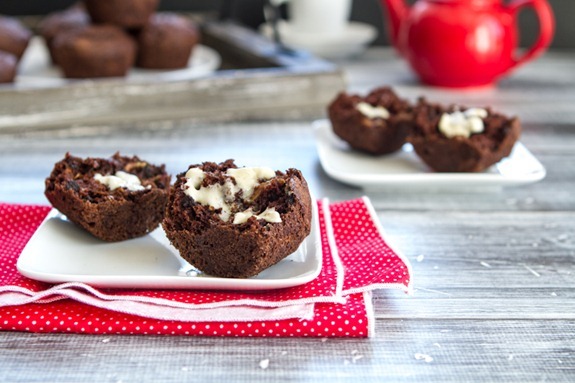 :) I’ll have to try a gluten free version of these chocolate muffins! Oh goodness…these look so good! I like how you made it oil-free, especially because store-bought zucchini muffins or carrot cake muffins are always SO oily! those look just magnificent!! wow yum!! I loooove zucchini nut bread but have never made anything with chocolate and zucchini! I will have to try these!! Thanks for the great recipe! Great idea to add cocoa powder! I always have lots of zucchinis to use up in the summer – so much better from the market! Another good way to eat them – sauteed zucchini and mushrooms with kale. Add some lemon juice and 1/4 cup water to help steam kale. Toss with walnuts and tamari! So good. I think this is now at the top of my “recipes to try” list – I have a produce drawer full of zucchini and am quickly running out of ideas for them. Thanks so much for the great idea! Can’t wait to give these a try. I have been making little mini muffins a little healthier for my 5 year old that likes to have a couple as a snack. I love the veggies in it since he is one of those kids that turn their nose up at any and all veggies unless it’s hidden in his food. Hi Angela, I am not vegan but I do eat dairy-free. So I was just wondering, can you sub in a regular egg for the flax egg? Or will this give the recipe too much of a different texture? They look delicious! Made this today. Turned out great and I even reduced the sugar and used Coconut Palm Sugar instead. Thanks for the great idea and recipe. I’m spending the day making breakfasts for the kids for the next week as tomorrow starts school here in Florida. Making a bunch of grab and go stuff and I know they’ll LOVE these muffins!! definitely need to try these… such incredible ingredients! I’ll have to sub the cane sugar with coconut sugar (what I have on hand) and use oat/buckwheat/brown rice flour to make them gluten free, I think it will work perfectly! and I will be making these muffins real soon. Yummy!! Glad you like them Edith! 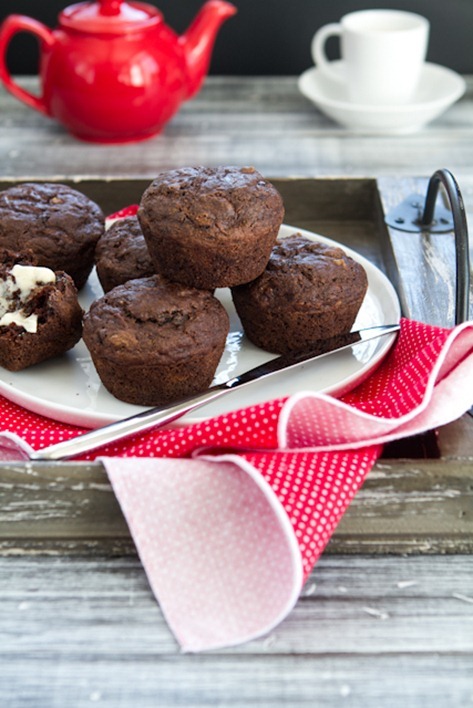 I’m hooked on chocolate zucchini bread and would love a batch of these muffins. Great recipe! Angela, i just made these and followed your directions to a t. SO GOOD! i used to bake all the time before becoming vegan, and these have inspired me to revisit that love. your blog is a huge inspiration, thank you so much!! I don’t have any zucchinis…do you think I could use carrots instead??? Hi Jess, the zucchini adds quite a bit of moisture I think and I’d be worried the carrots might dry it out, so im not sure on this one. if you do try it, let me know how it goes. I can’t wait to try your version! I have a similar recipe to this but not exactly so it will be great to try this! I am locked and loaded with zucchini this week too. ;) Thanks Ang. I made these the other night and they turned out amazing! I am new to vegan baking and I never imagined a muffin could taste so good without any dairy, eggs or oil! Im so happy to hear that Aimee! Hi Angela! I want to try these muffins for my kids. I have to sneak veggies into their diet. I’ve been trying to be low sugar for awhile and was using agave. I’ve been reading that this is not a great choice. Can you tell me where I can buy cane sugar? these turned out sooo yummy and chocolatey! threw in some extra zucchini too just to use up what i had, and couldn’t even taste the vegetables ;) instead of walnuts used a mix of almonds, pecans, and pumpkin seeds. thanks for the great recipe! Made these muffins yesterday and love them! I’m going to try a gluten free version next! Thanks for the recipe! I baked these muffins this morning. Yum. Delicious and very light, I am working my way through your recipes and so far success and a feast to my taste buds. So far have made kitchen sink nut better, lentil bake, oatmeal peanut butter smoothy to name a few. It is pleasure to follow your blog, to enjoy coking and sharing in an abundance of healthy dishes. Thank you for all the work that you put into trying your recipes before blogging and also for sharing. 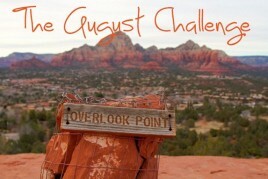 Congrats on meeting your challenges this month. You inspired me to meet mine. One was to book a shamanic healing session, which I have been putting off. It will make me move forward in life and put aside self imposed excuses for not having the courage to take that leap of faith in myself that I need to take. I wish you happiness and success . Happy blogging ..
They’re in the oven now! Can’t wait. I love zucchini anything so this was right up my alley! Thanks Ang! They puffed up A LOT and look kinda funny but they are delicious! My sister and I agreed they are the perfect breakfast muffin. Thanks again! Another great post! Thanks Angela! Perfect timing!! I have zucchinis coming out of my ears right now–they’re everywhere! These muffins will be a great way to get my step-son to eat some veggies, too :) thanks for the recipe! Chocolate… and healthy… yum, this one got me! Hopefully I can make them this weekend. I made these last night and they turned out great! I used Ghiradelli cocoa powder and used Bob’s Egg Replacer instead of a flax egg (no flax on hand!). I found I had enough batter to fill most of the muffin tins completely full and a few of them 90% full. The muffins still turned out beautifully and I enjoyed one for breakfast this morning. Thanks for another home run recipe! I’m new to your blog, but I’ve found that sprouted wheat flour makes absolutely lovely muffins and the like! It is light and fluffy and still whole grain. Have you tried that? I haven’t tried it with this recipe, but have been making a similar blueberry muffin with it and they are really terrific! Hope this is helpful info! These muffins are fabulous!! 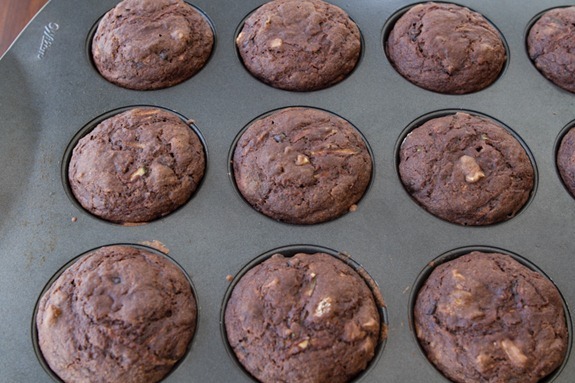 I didn’t have cocoa powder so I used organic carob powder instead – that was the only substitution – I didn’t even have to loosen them from the muffin pan, they popped right out! Delicious, moist and sweet with the mini chips! Thanks. My daughter and I made these a few days ago. Delicious! Thanks so much. Just wanted to say I’ve already made these muffins five times. My husband loves them and keeps grabbing more zucchini from our CSA so I’ll make more of them. 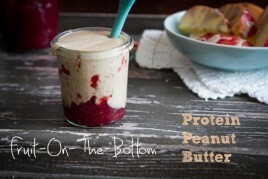 They are a perfect breakfast/snack/dessert! These look great but I am not a big fan of cocoa powder. Do you think it would really change the muffins if it was left out? Hey Sarah, I wouldnt recommend leaving it out – the cocoa powder interacts with the baking soda and ACV in this recipe. Angela – Just took these out of the oven. Can’t wait to try! Do you think that you could sub the zucchini with mashed banana? Just made these! They came together really easily and are really delicious… Plus the hubs loves them too! Two excited to find a good oil-free muffin recipe. Oh and btw, I halved the sugar (used 1/4 cup) and didn’t miss the rest at all. Cheers! Just made these! Soooo good. Cured my chocolate craving! Love how moist they are! These are my all time favorite muffin now! I make these and share and everyone always loves them and asks for the recipe! Just wanted to share, I’ve made these with carrots and zucchini before and they turned out great. I’ve also use reg wholewheat flour and they turn out awesome. Thanks for all your great recipes, I always share your website with people. Thank you Misty I appreciate it! Do you think these would work using a gluten-free all-purpose flour (specifically the Bob’s Red Mill brand)? 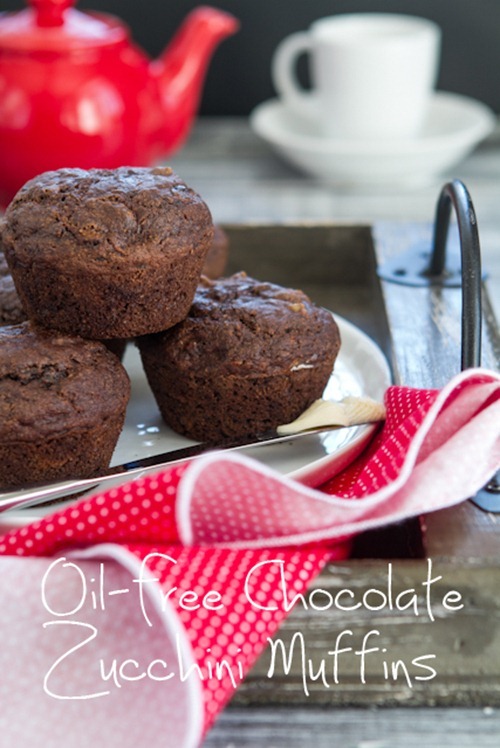 These look delicious and I love that they are oil free! I just tried these with gluten-free all-purpose flour and they turned out great! I’m glad to have found an awesome muffin recipe! Thank you Angela! Love your recipes. I came upon someone on twitter making muffins with this veggie and was interested to investigate. Im trying to slowly add more veggies I don’t eat into my diet and am thinking of trying these out on the weekend. I think I have an oat or hemp milk at home instead of almond. Hopefully that’s fine. Any advice for using any leftover zucchini for someone new to the veggie? Lauren, you can’t go wrong with zucchini fritters. You can find lots of recipes on the web, Just be aware there is no need to fry them in a lot of oil. A very light spray on a non-stick pan is all you need. Eat those veggies, young lady! I just took a batch of these muffins out of the oven. I made them once before the holidays and gave them all away. I’ve been wanting to make some to keep ever since, so with a bonus snow-day here in Chicagoland and one lone zucchini on hand I was ready! Im so excited about my muffins! So easy to make and they look so good. I just took them out of the oven and cant wait to eat one. Your website has completely inspired me in the kitchen. I have recently become vegan for various reason so these will be perfect for breakfast! THANK YOU SO MUCH! I made these yesterday – didn’t have whole wheat pastry flour so I used 1 cup reg whole wheat and 1 cup reg white flour – They turned out great! I also ground the walnuts in the food processor (to hide them a bit) so my daughter would eat them – she’s 4 and she loves them! Thanks for the yummy recipe! I used a gluten-free pancake/waffle mix instead of the flour, baking powder and baking soda, and these turned out fantastic! I also subbed coconut milk for the almond milk and again, it worked beautifully. Thanks! I made these today and they turned out great. I had no maple syrup and they were still sweet enough. made 12 large muffins! So glad you enjoyed the muffins – thanks for blogging about them! So – it’s a year later since you posted this recipe – but I finally got around to making these yesterday. I’m in love! The whole wheat pastry flour was worth it (which was added to my growing collection of flours in my pantry)! I really love all the recipes you post and I want you to know that I appreciate all the help that Oh She Glows! has been in the past year since I transitioned to being plant-based. Thanks! I made these muffins for our Vegan Food & Wellness Fair. I made them sugar free. I substituted the came sugar with dates. It gives the muffins some added fibre and makes them moist. So tasty, great muffin. I made few changes. I measured less sugar, only 1 cup almond milk, used chocolate almond milk and added 1/4 of unsweetened apple sauce and used 1 cup whole wheat flour and 1 cup coconut flour. These are AWESOME! I left out the nuts and made mini muffins instead. I got 52, making them just 25 calories per mini muffin! Thanks, Angela! woops, left the flour out of my nutrition calc. 40 calories/mini muffin. I love your website! I’m new to the whole vegan and gluten-free style of baking, but everything on your site is so easy to follow and always ends up turning out like your pictures! Quick question – what would you recommend to do for saving these muffins? Are they able to be refrigerated? I could seriously eat all of them now, they turned out so well…just trying to prevent myself from doing just that!!! :) Thanks! My partner and I have been making a batch of these muffins every week for the last month and a half… They are absolutely amazing. I’ve been sending the recipe to everyone I know! Fantastic recipe as always! Looking forward to receiving your cookbook in March :). Would I be able to use Almond or oat flour? I am starting to realize I have a sensitivity to gluten. Sooo delicious! I just made these and i tried to eat only one but i couldn`t resist :) These are so moist and perfect! Angela, you are incredible ! Could I sub coconut palm sugar for cane sugar? Just made these and they were de-lish! We are avoiding processed sugar, so I used a 1/2 cup maple syrup instead of the 1/2 cup sugar and they turned out great. My 3 yr old son is gobbling them up. 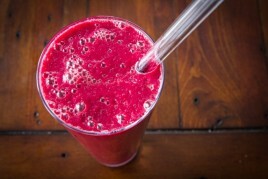 Perfect amount of sweetness, such a healthy, but yummy treat. These were delicious, and oh so healthy! I substituted the white flour with brown rice flour, protein powder, flaxseed and sorghum. I didn’t add nuts but did sub cocoa nibs instead of chocolate chips. I just made these and they are deleesh! What else can I use as an egg replacer besides the flax? I don’t enjoy the flavor of flax so would chia seeds work as we’ll? I made these a few days ago and they rocked my world! Quick , easy and delicious. They are all gone. also used gf all-purpose flour to make them gluten free and they turned out well. Hi I tried making these..nay be it was the type of flour I used (white whole wheat) but they came out very dense and weren’t very chocolatey. I even increased the apple cider vinegar to encourage the bubbling reaction with baking soda (i usually use 2 tbs for sweet bread and cupcakes and it always works well. ) I’ll try again maybe with half white flour, more cocoa and just use baking soda and no baking powder. Great idea and lovely photography though! I made two batches this afternoon! They are moist and tender and the chocolate smell is wonderful! I set out to make a double batch this morning to take to a meeting, and ended up with 24 muffins plus so much leftover batter that I made a small loaf of bread as well. These are some very tasty muffins, thanks so much! Mine looked just like the ones in your picture. I am puzzled as to why I had so much extra batter, but will be happy to have more to eat! I just made this recipe and the results were fantastic. So good and so easy. I only needed to add extra time in the oven. Also, my kids ate them, of course I didn’t tell them there was zucchini in the muffins. Loved this recipe – used less sugar, and made a batch of mini muffins, and a “loaf” – totally cannot stop eating them! Yum. Thanks for the delicious, no oil, vegan recipe! These sound perfect for my ‘what to do with all this zucchini’ plan. Do you think I could sub in oat flour for ww? I just wanted to let you know that everyone in my household (me, husband, and 3 elementary school aged boys) all love these muffins. I’ve made this recipe more times than I can count. Thank you so much for a delicious low-fat vegetarian recipe that makes everyone happy! how can i make these gluten free? what flour would you recommend using? Hey!! Just made these and the are AMAZING! Just curious how you store yours after?? I like keeping them out to stay moist but I wasnt sure becuase of certain ingredients. Delicious! For an extra nutritional boost I doubled the quantity of zucchini and threw in some chia seeds to absorb the moisture. Also tried it as a brownie because I’m too lazy to clean muffin pans – worked a treat! I just made these but replaced the zucchini with banana as had no zucchinis. OMG, they are deliciious. I will try with zuccchini very soon as have growing in my garden atm. I made these today and found the batter to be extremely thick. 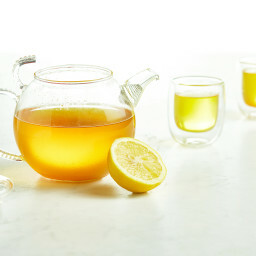 I followed your recipe exactly in the book (substituting lemon for apple cider vinegar). They turned out very dense and not quite as I had expected! Has anyone experienced this before? mine where overly dense too, for me i think it was because my milk didn’t curdle enough, that may be the same reason for you? I’ve put many of my muffins and bars in the freezer and they all just as amazing when I take them out. I’m sure the same applies to this recipe too. I love these so much. They really do give an energy boost and they are so light. They never leave me feeling bloated or icky like other dessert recipes. I do not like them with the walnuts though. Hi Angela – I LOVE these muffins but I find they go moldy very quickly – Do you have any tips for storage so they last a bit longer? I keep mine loosely covered on the counter for the first day, in an airtight container the day after, and in the freezer any time after that. They thaw in minutes and are a great easy treat! This recipe looks fantastic and I am eager to make it this weekend. Actually I am eager to make most of these recipes in your cookbook. That being said, have you ever tried making these gluten free with gluten free flour in place of the whole wheat flour? Do you think I can do that with a cup for cup replace? I made it with GF flour and used the Namaste brand. I also subbed 1/2 cup of the flour for protein powder and it was AMAZING! I had too many zucchinis, a four year old hankering for a “project,” a two year old who no longer wants to eat vegetables, half a lemon with no purpose and some walnuts that I’m worried will go rancid soon. This fit the bill oh-so-perfectly! Thank you! Although, I feel like they need a spice of some sort, perhaps nutmeg? We love these and my husband still doesn’t believe me when I say there is no oil. Thanks for sharing! HI! If we wanted to make these gluten free, what kind of flour would you suggest? Thanks for sharing this recipe. Just baked it this morning and it turned out great. Prepped the ingredients the night before and they were ready just in time for breakfast. Shredded zucchini night before and put them in fridge. Had to add about 5 more minutes to baking time and they were awesome! just made them and they were delicious! I used oat milk instead of almond milk, so the milk didn’t curdle well, and I used spelt flour instead of whole wheat. They were a little more dense than they should have been since I messed up the recipe a little, but the flavor itself was great! Hi there! this is one of my favorite baking recipes i make it all the time :) i would like to make it for the holidays but my friend is gluten free- any way i could make this gluten free? Thank you so much! Made these from the book, using Sukrin Gold instead of sugar (type 2 diabetes), and omitting the walnuts, absolutely delicious, went down a treat with the family, and only 136 cals! I will be making these this week as I made them awhile ago and remember loving them so much! However I had all purpose whole wheat flour and wanted to make sure they would turn out just as good if I use that instead of whole wheat pastry flour? – Thank you! I’ve had a wonderful time the last couple of months exploring your cookbook! I tried these for the first time yesterday, and unfortunately, even after baking for more than double the recommended time, the centre’s were still doughy/wet. I’m sure I made a mistake somewhere! The only substitution I made was regular granulated sugar for the cane sugar. I’m hoping someone else made a similar mistake to me at some point and figured out what it was! I am a bit suspicious after reading the comments about whether I may have inadvertently added 1 tsp of baking powder rather than 1 tbsp – maybe that is the culprit! Hi there, I’m so happy to hear you’ve been enjoying the cookbook so far! It’s too bad, though, that the muffins didn’t quite turn out. My guess is that you’re right, and it’s the 1 tsp versus 1 tbsp of baking powder that’s the culprit (2 teaspoons less than called for can have a huge effect in vegan baking), assuming oven temperature was where it should be. If you give the recipe another shot, please let me know how it goes! It’s zucchini-glut season here in NZ and I made these to use up a couple! I substituted gluten-free baking mix for the flour, left out the salt and cut down the baking powder. They are DIVINE! Thanks so much for the recipe Angela – it’s definitely a keeper. Going to share with my tribe! Love them! Since changing our diet for health reasons (which has meant WFPB style) I have tried quite a few recipes that would suffice for giving kids when we feel like a baked treat. Sadly many recipes to date have not been successful (or they contain too much oil for our liking) until we found your blog and bought your cook book. In this recipe I used 85% chocolate and also supplemented some cacao powder with some carob powder, but followed everything else to the letter. They were so much lighter than other cake style recipes (even with whole wheat flour), and just the perfect amount of sweetness. Thank you for spending the time coming up with these yummy recipes. 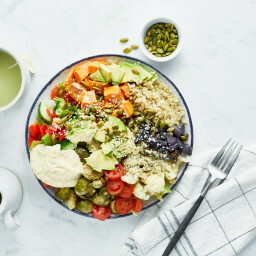 We’re eating your empowered two way noodle bowl tonight, and just finished making your almond milk recipe. 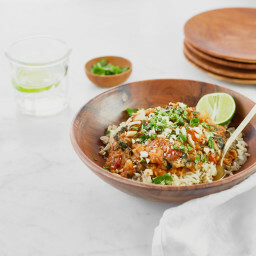 Hi Helen, I’m so happy you’ve been enjoying the blog and cookbook. Thank you for taking the time to let me know! It’s always wonderful to hear my recipes are helping someone enjoy a satisfying transition to a more plant-based diet. This recipe calls for 2 Tbls baking powder but your cookbook only calls for 1-1/2 teaspoons. I went with the smaller amount. Eating one hot out of the oven and I think they are going to be dense. Will have to make a note in my cookbook. 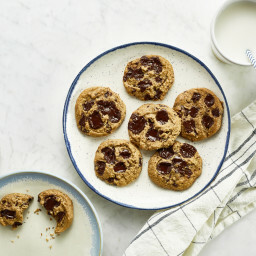 This enticing recipe in your “Oh She Glow’s” printed cookbook calls for 1 1/2 tsp baking powder and 1/2 tsp baking soda. Here / online, you call for 1 tbsp baking powder 1 tsp baking soda. What works best? I look forward to making it soon… Thank you! Please, oh please reply! Thank you, Angela! I just found this recipe and I LOVE them. I’ve made them three batches in the past couple of weeks. Made these for a luncheon at work and they were accepted and loved by all! Keeping in mind 90% are not vegan ,vegetarian and certainly not oil free. Do you know if this could be made into a cake ? Hi there- love these muffins! How are they for freezing? So happy you enjoy the recipe, Jen! They freeze well in an airtight container, and thaw beautifully. I just made these from your book and they are DELICIOUS!!! My husband likes them too and we especially like that they are not too sweet. Hi! Any idea if these would work with a gluten free flour? I see lots of questions about gluten free but I’m not sure I see any responses! Hi there Nicky, I’m sorry, I haven’t tried it myself! But I think a number of readers tested the muffins with an all-purpose gluten-free flour and had success with it. If you decide to give the swap a try, I’d love to hear how it goes for you, too! Thank you for sharing this recipe! My family, more importantly my kids, love it! I made a couple of minor adjustments for my little ones. I added a link to your book and this recipe on my site. Do you use plain cocoa powder or the “Dutch processed” kind? Hey Kimberly, I use Cusine Camino “Dutch-Processed” Cocoa Powder most often. Hope this helps! Can I use Apple sauce instead of cane sugar? Can flour be switched to Teff and how much? We LOVE these. I omit the nuts in case I have people over with nut allergies, and add mashed bananas. Bake a few minutes more, and they are a hit, every time. I sneak in more chocolate too :) This recipe has never failed me – I make these 2 times a week, and I double the recipe. My kids take these to school for their daily snack. Great for freezing as well. Wait, they do not last that long! Another excellent recipe! I had my friend Marisa over for coffee and she was delighted when I served the muffins. They were sooooo delicious!!! I did not see where I could give it a FIVE STAR rating! Could I make these wheat free?